The beautiful dry leaf, blended with lemongrass and slices of orange, emits a mint-forward aroma. The first sip of this golden liquor is a nicely balanced mix of clear green tea, spearmint and citrus. The lemongrass adds zest and brightens the flavor balance. The cup retains a light mint character which is refreshing. The aftertaste is lightly sweet. 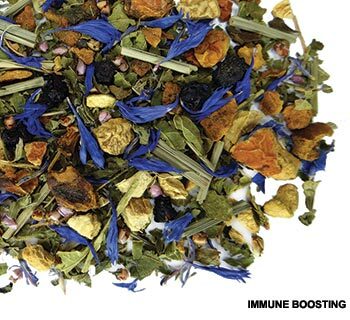 What a sensational flavor in this ever-popular blend. Lemony and minty flavors come together with the slightly earthy green tea to yield a delightful harmony. If you loved Teavana’s Jade Citrus Mint, this green tea is your new fave. This green tea is a great choice any time of day, but especially mid-afternoon when you need a pick me up or start to crave something sweet. Team it with fresh fruit and you are all set. Or at mealtime, pair it with a noodle or rice dish. Spice up your plate; the citrus and mint blend will balance it all out. 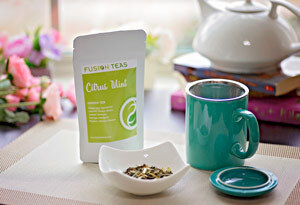 Citrus Mint Green Tea is delicious piping hot or served over ice. Or, use brewed and chilled tea in place of water in your next smoothie. Spearmint leaves, slightly milder in flavor than peppermint, are a traditional herbal aid for digestion. The mint herb is also touted to relieve nausea and helps with bad breath.